oh the art room. the art room is to an artist as a operating room is to a surgeon. and i have been fussing with my art space since the day we moved into our 1923 spanish craftsman. the room is square. about 100 sq. feet. and every arrangement of supplies i tried made it look like a storage room rather than a creative space. at last i think ive got a space to fit the creative needs. i dealt with the space like this: treat each wall like its own ‘zone’. one wall for the desk and printmaking/drawing/fabric/paint supplies. the next wall was kept open to let as much natural light in as possible. the third wall is the inspiration/library/chill out/music zone. i used all the furniture i already had just moved it around and repurposed. the black book shelves were moved to create the supports for the vintage metal rack desk top. 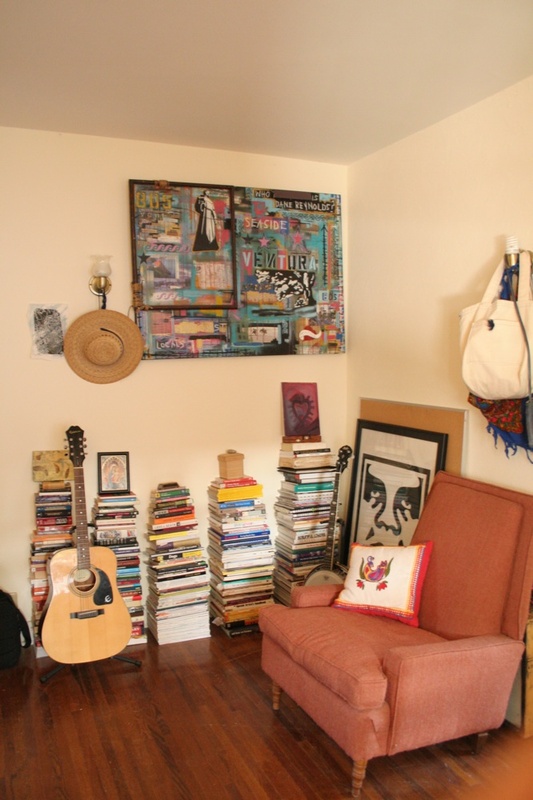 instead of being confined to shelves my books were freed to live in stacks on the floor. the room could still use more natural light but until i poke a massive hole in the ceiling and install a sky light; open windows and lamp lights will have to suffice. i am now satisfied with my art room now onto the backyard! enjoy! This entry was posted in Art, art, design, digital photography, Photo, Photography and tagged Art, Caifornia, decor, Design, Digital Photography, Home, Interiors, mid-century, Painting, photo., Photography, Spring, Vintage. Bookmark the permalink.